Gourmet Chef Prepared Pork Dinners Online - Lamb & Veal Dinners - Gourmet meals prepared fresh daily by well-know chefs with fast home delivery. 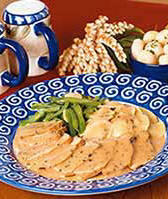 Chef prepared dinners and entrees, party appetizers, specialty side dishes to complete dinners. 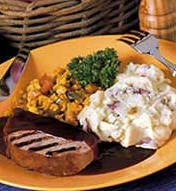 Complete pork dinners online, lamb or veal dinners & meals. Just heat and serve. 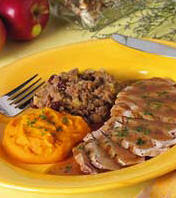 complete pork dinners & meals with side dish entree's and vegetables. We mix, blend, and saut�. We grill the steaks, roast the lamb, poach the salmon. All you need to do is follow the simple instructions to heat and serve our meals in about 10 minutes. It's that easy. Home Bistro chef prepared dinners such as pork, lamb and veal dinners and meals... We use only the finest ingredients, we prepare everything, with skill, know-how, and artistry, just for you. We do all the time-consuming things. We shop and we chop. We mix, blend, and saut�. We grill the steaks, roast the lamb, poach the salmon. All you need to do is follow the simple instructions to heat and serve our meals in about 10 minutes. It's that easy. 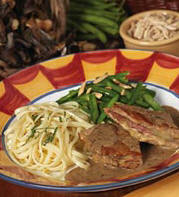 Sauteed veal cutlets layered with prosciutto and provolone cheese topped with a wild mushroom demi-glace made with white wine, shallots, and thyme served with linguine and green beans with almonds. Roasted rack of New Zealand lamb in a deep brown garlic sauce made with white wine and shallots complemented by creamy garlic mashed potatoes and peas with caramelized pearl onions. Tender pork loin in spicy Thai red curry sauce made with coconut milk and brown sugar accompanied by green beans with water chestnuts and agnoletti pasta filled with broccoli and creamy ricotta cheese. 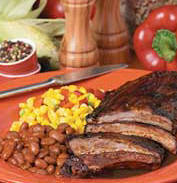 A slow-cooked, half rack of tender and meaty baby back ribs in our uncommon barbecue sauce made with plum tomatoes, garlic, ginger, onion, brown sugar, and cider vinegar served with baked beans mildly seasoned with cumin and chili powder, and a blend of corn, fire-roasted red peppers and baby lima beans. Center-cut, fully trimmed boneless pork chop in our own tangy barbecue sauce served with red skin mashed potatoes and a medley of grilled vegetables. Tender pork loin topped with a reduced apple cider sauce and accompanied by apple-pecan stuffing and a squash pur�e sweetened with real Vermont maple syrup. Home Bistro Offers 2 Limited-Time Specials for our Customers Only - Pick either your choice of Filet Mignon with Red Wine Sauce or Filet Mignon with Bearnaise Sauce at half price with any order over $50. Instructions: enter HalfPrice coupon code during checkout to see and select your choice of the two half-priced filet dinners. Or you may have the choice of any pasta at no charge with any order over $50. Instructions: enter HBPASTA coupon code during checkout to see and select your choice of pasta. At A La Zing you'll find a wide variety of prepared dinners ranging from hearty home-cooked fare to elegant, gourmet dining. No matter what the occasion you're planning, A La Zing has a selection of gourmet prepared dinners and complete meals made fresh and ready for fast online home delivery. The complete meal. And to simplify life, you'll find that all of our selections are easy to fix, delivered right to your front door, and come with a variety of serving and entertaining suggestions. Rest assured that we use only the finest ingredients and recipes in all of our creations. We feature beef selections from world-famous Omaha Steaks and desserts from David Glass... so you are sure to be impressed with the quality of each and every meal and your order is backed by our 100% Satisfaction Guarantee. Omaha Steaks is located right in the heart of beef country where conditions are ideal for raising the highest quality cattle. Midwestern, grain-feeding gives our beef superior marbling which makes it the most tender, tasty beef anywhere. 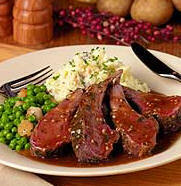 Choose from premium quality top sirloin steaks, luscious beef roasts and gourmet beef steak combos / entrees.